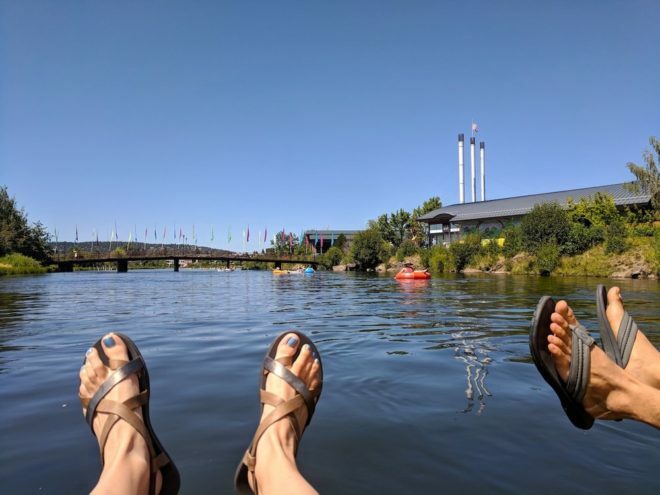 The river in Bend is wide and easy to navigate, rentals are readily available, and there’s even a shuttle system so you don’t have to figure out parking two vehicles at separate ends of your route. 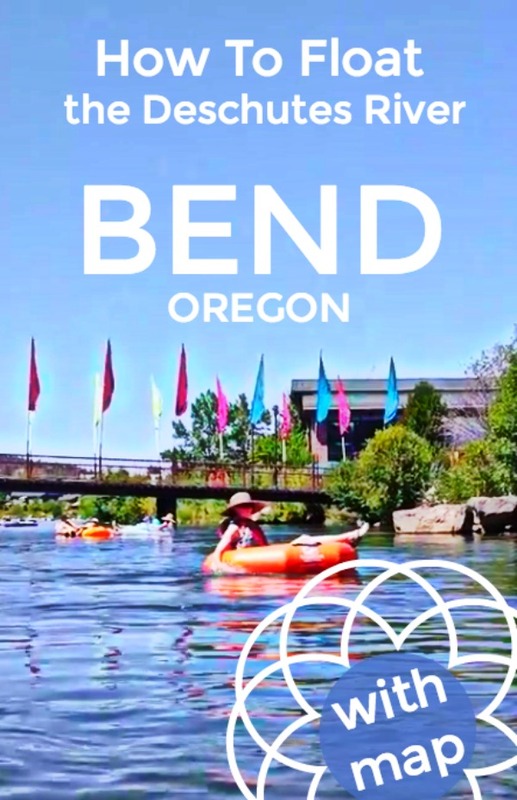 Compared to the float in Tumalo, there’s less hassle and more ease floating in Bend. 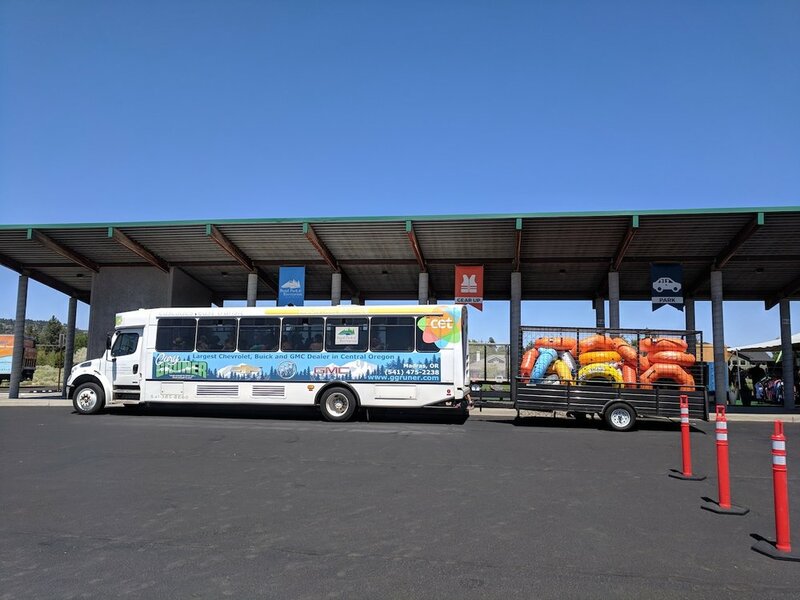 To use the float shuttle, park for free at the Park & Float. Purchase a $3 shuttle pass from the booth under the big tent. This gets you access to the shuttle all day. 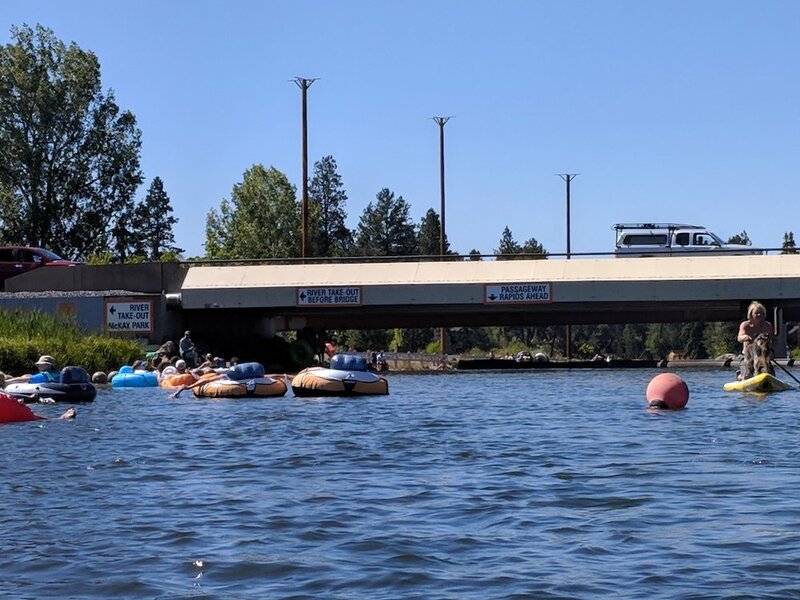 If you don’t have your own tube, you can rent one from Tumalo Creek Kayak & Canoe at the same spot (rentals are also available at River Bend Park). Staff will help load your tube in the trailer behind the bus. During busy times, they ask that you bring extra large or double tubes deflated because they take up too much space in the cart. 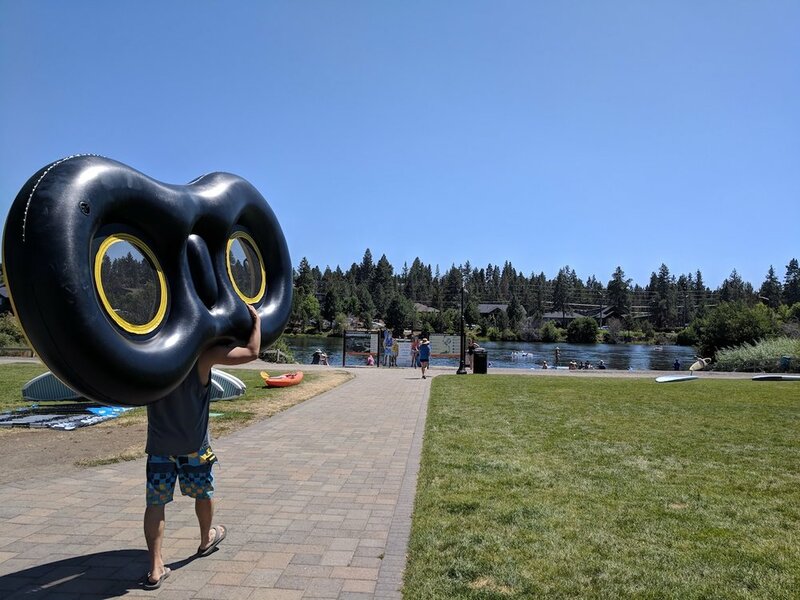 When you arrive at River Bend Park, just find the Tumalo Creek Kayak people and they’ll inflate tubes for anyone with a shuttle pass. The Ride The River Shuttle typically operates from 11am to 5pm in the summer, with more frequent buses on warm weather weekends. The first leg takes you to River Bend Park where you can safely and easily enter the river. The second leg of the shuttle will pick you up from Drake Park and return you to the Park & Float. The float from River Bend Park to Drake Park took us around an hour. If you’re driving yourself, you could make it longer by starting further up the river at Farewell Bend Park. You also have the option of getting out half-way through at the Bend Whitewater Park, which is a short walk back to the Park & Float area. 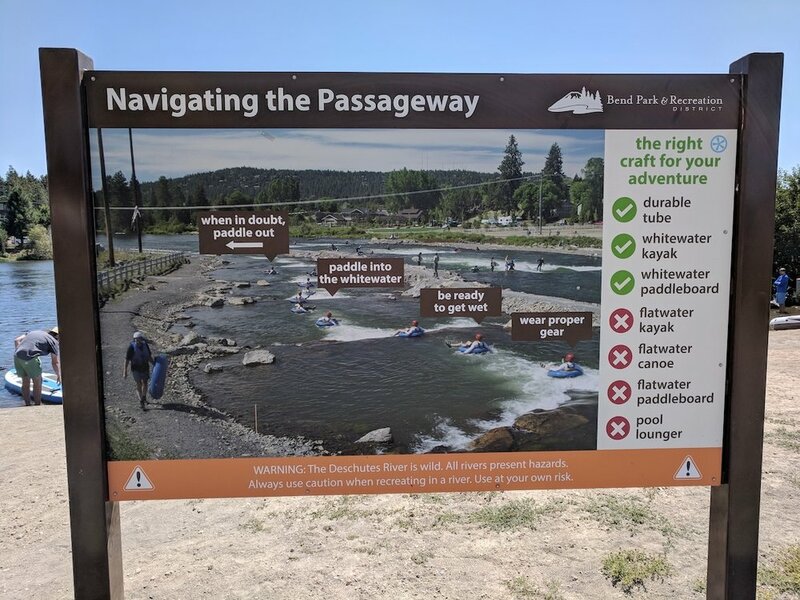 Note that if you continue on at the Bend Whitewater Park to Drake Park, you do need to make a choice of whether to go through the passageway of man-made rapids or walk around. As you approach the Colorado Avenue Bridge, you’ll see signs that everyone must move to the left side of the river. This is because on the right is a white water section that’s only for experts (no tubes). You can stay in the water and go through the passageway on the left for a series of small, fun rapids. Or you can get out of the water just before the bridge and walk around the rapids instead. Another float route option, which avoids needing the shuttle or two vehicles, is to park within walking distance – between the Bend Whitewater Park and the Park & Float. Our friends who live in Bend showed us this option. The float is only about 30 minutes, but the walk back to the Whitewater Park is easy so you can do it multiple times if you want. Directions for this option are below. Like this post? Pin it for later or share with friends!